It has been nearly a decade since critically acclaimed cult artist Luke Chueh rocked the Pop Surrealist/Low Brow art scene with his visually stunning work. 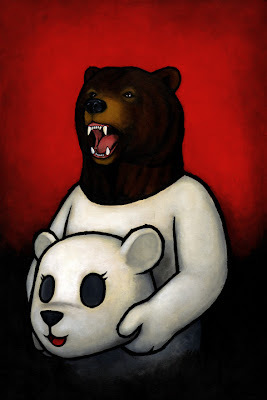 With the release of "The Art of Luke Chueh: Bearing the Unbearable" from Titan Books, The Daily Zombies reviews the Los Angeles-based artist’s first monograph collecting the first seven years of his astounding career (2003 – 2009). 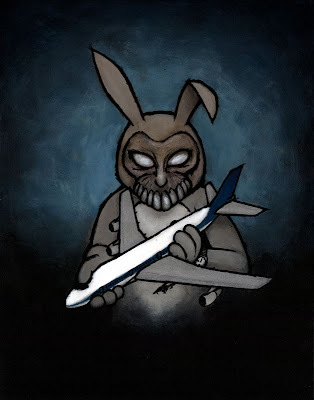 "Like a cuddly Trojan horse, Chueh's work is pretty on the outside, but nice and macabre on the inside". Reading from the back cover of the dust sleeves of the weighty coffee table art book, this was how Entertainment Weekly described the successful cult artist who have arguably made more than a name in the Pop Surrealist/Low Brow art scene with his starkly macabre yet adorable work. Having the great pleasure and privilege to be given the opportunity to interview the Los Angeles-based Chinese-American artist earlier this month, I was excited to receive the review copy of "The Art of Luke Chueh: Bearing the Unbearable", the artist’s first monograph collecting the first seven years of his astounding career (2003 – 2009). For those who are unfamiliar of what exactly constitute the rather unpleasant namesake of "Low Brow" as the title of an art-form, look no further than the popular Juxtapoz magazine. Officially known as Juxtapoz Art & Culture Magazine, the magazine stands proudly front and center as a pseudo journal of the Low Brow movement and by no coincidence had the largest circulation of any art magazine in the United States. Therefore, it should come to the surprise of no one that I have first chanced upon the artist in a feature article published in the magazine. 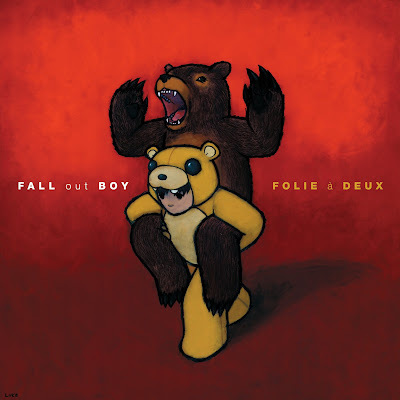 With that said, the artist have long been a pop culture mainstay with his work translated into Munny dolls, t-shirts (and a bootleg one that happens to be wildly popular and "inspiring", to the dismay of the artist), and even into the album cover for Fall Out Boy's 2008 album Folie à Deux. Perhaps the most iconic images to have come out of the artist's massive body of work would be "Bear In Mind", a piece of personal significance to the artist as well (head over to our interview with the artist to learn more). While one might easily (and lazily) associate the artist's work to unlikely cute/gore amalgams the likes of cult internet phenomenon flash cartoon series, Happy Tree Friends, it doesn't take an art aficionado to comprehend the immense level of sadness of Chueh's work when they look deeper and closer into them. 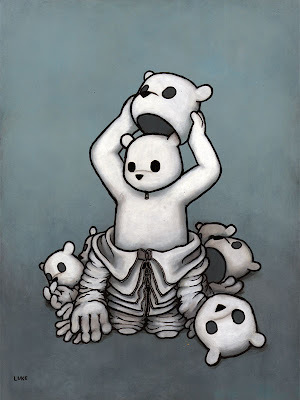 Which brings us to a running theme to most of Chueh's work: Façade. 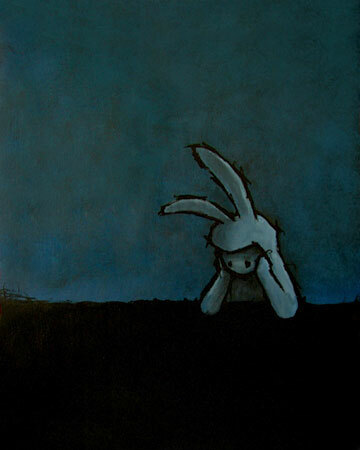 Right from “Feeling Blue”, the first piece of work presented in the book that is incidentally the first to be sold by the artist back in 2003, it doesn't take an educated art critic to have a foreboding sense of a bold new artistic dimension ready to be unleashed through the unrelenting style of Chueh. The peculiar formula to Chueh's method to the madness of employing a muted, silent atmosphere for the otherwise colorful, cuddly animal characters: Façade. Be it the iconic "Bear In Mind" or the aforementioned album cover for Fall Out Boy's 2008 album Folie à Deux, the overarching theme remained dominant throughout the remarkable portfolio of Chueh. 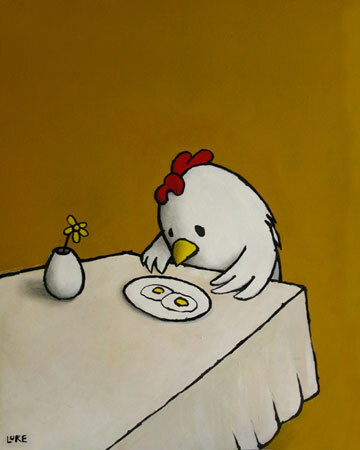 While at once humorous and even satirical, one cannot shake off the endearingly melancholic sense of being embedded in the imagery. You might argue that Chueh stuck closely to the tried-and-true formula of illustrating the adorable animals in full-blown display of graphically violent scenes across the dark and depressing backdrop, but that would be over-simplifying the unique energy Chueh imbued into his work: A special quality that is perhaps best described as catharsis, both for the viewers and the artist. In "The Exit", we have perhaps one of the best example of this quality with a heart-felt impact. The running theme of despair and disappoint continues in Chueh's series of self-portraits. 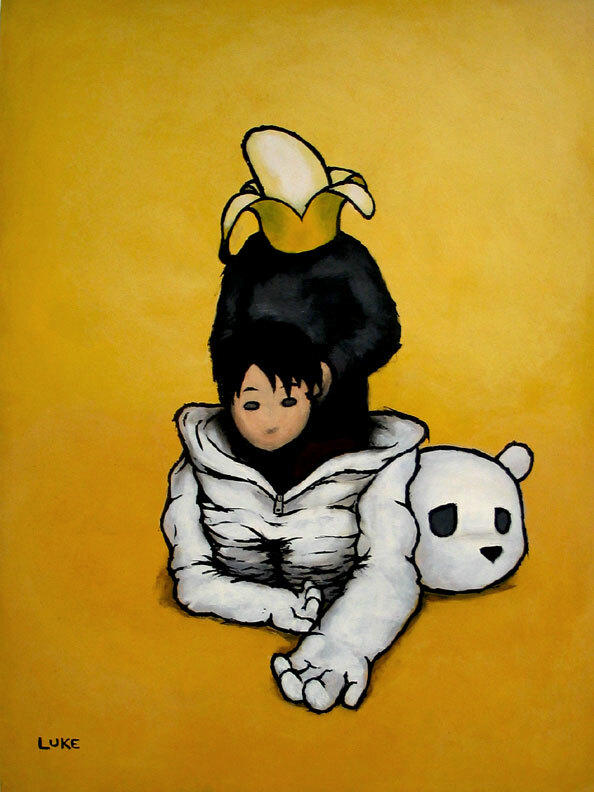 In "Self Portrait 3", we see Chueh resonating with his ethnic Chinese origins by playing a pun on the old banana man saying (yellow on the outside, white on the inside). 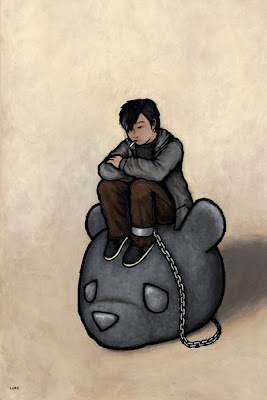 Unfairly known by some critics as "the bear guy", Chueh also continue to live with his "love/hate relationship" with his running theme of featuring cuddly bear in this self portrait known as "My Ball and Chain". In "Inside Out", Chueh pushed his theme of "façades" to the next level with an interpretation of those who are stuck with themselves despite their efforts. 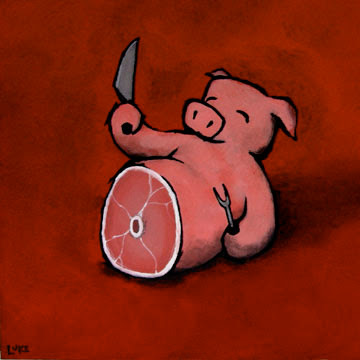 However, not all is grim and dark catharsis with Chueh's work. In "I Asked For Scrambled", now a semi-iconic piece that have, to Chueh's dismay, been bootlegged into a t-shirt in Japan to overwhelmingly popular reception with variations of the concept running amok, we have a good sense of the artist's clever take on the unlikely theme of cannibalism and flowers for the Cannibal Flower's third year anniversary show. 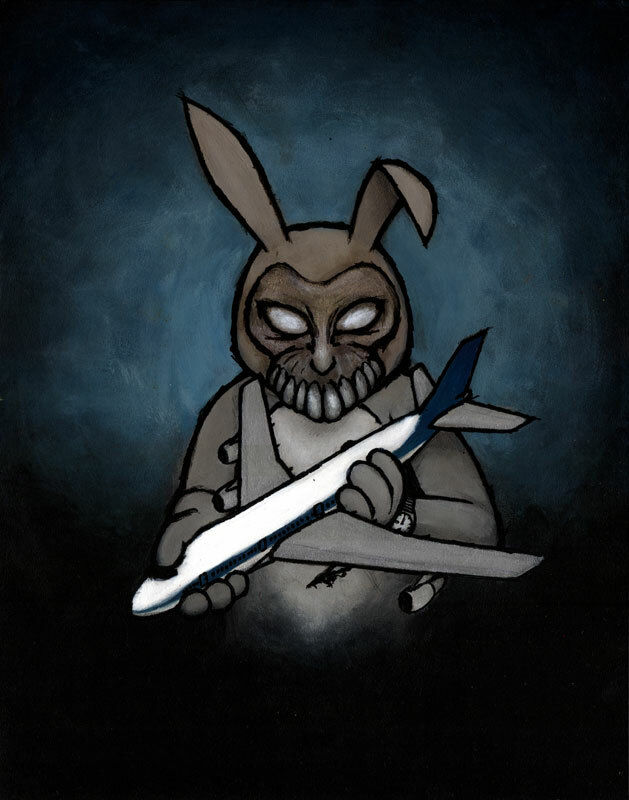 In "Frank", the cult artist took on cult classic film, "Donnie Darko". 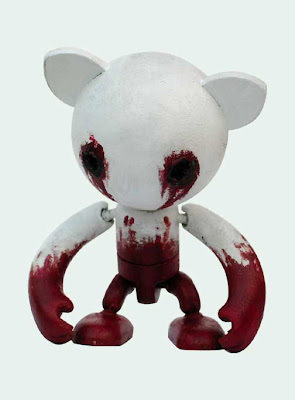 As mentioned earlier, Chueh has collaborated with others in turning some of his works into vinyl toys and the book also featured the pictures of these works. Here's a piece that he did with B.B.Birdy. Chronicling the first seven years of Chueh’s career from 2003 to 2009, The Art of Luke Chueh: Bearing the Unbearable niftily did so by presenting Chueh’s works in chronological order with a chapter for each year, allowing us to participate in Chueh's artistic journey as he progresses along time. Standing at a considerably gigantic 9.3” x 12.5”, art reproduction in this book is masterfully presented with no love lost. At over 192 pages, the hardcover volume printed in glossy pages also included articles by collaborators of Chueh, from Gallery 1988 Co-Founder Jensen Karp, Pete Wentz from Fallout Boy, to the Madden brothers from Good Charlotte. In addition, some of the more significant pieces were also put into special focus complete with commentaries from Chueh himself that shed some light on the work. 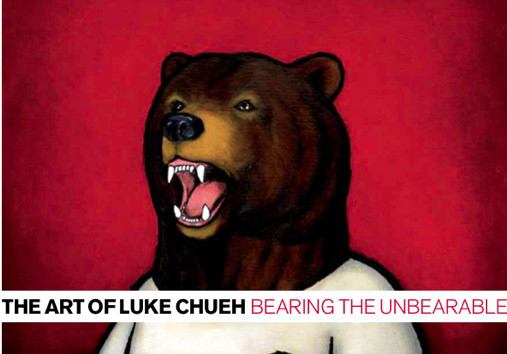 For fans of Luke Chueh's impressive body of work throughout his relatively short yet prominent career, "The Art of Luke Chueh: Bearing the Unbearable" is the definitive compilation of the artist's portfolio. Immensely personal and informative, this is an unmissable volume that is a worthy collection to the source material. For those unfamiliar with Chueh's work, this is a great opportunity to acquaint yourself with the artist's work. While it might be true that a retail price of $34.95 (USD) is perhaps too much an introduction fee, I implore you to check out Chueh's website, blog, or deviantART page for a brief preview of his work. 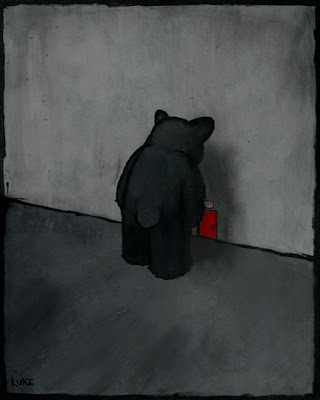 Like most of the art books published by Titan Books, "The Art of Luke Chueh: Bearing the Unbearable" is exceptionally beautiful both in terms of the contents and its presentations. And it goes without a doubt that the book is a delight for any self-respecting coffee table art book collectors. 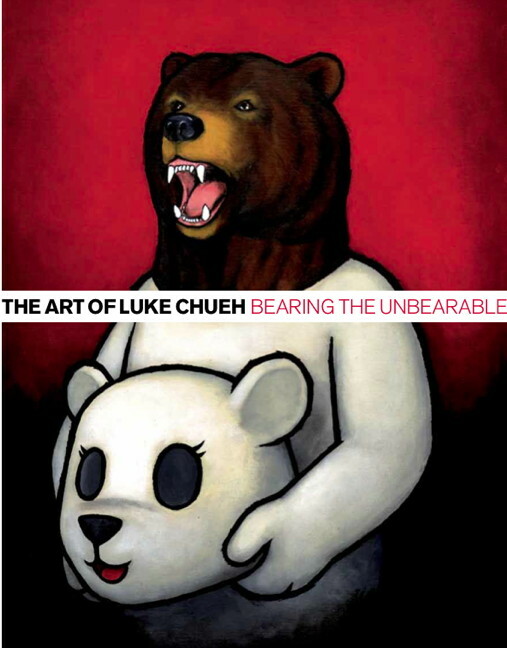 The Art of Luke Chueh: Bearing the Unbearable is now available in fine bookstores everywhere. For those who would like to order the book online, head over to Amazon.com or Titan Books. Special thanks to Tom Green from Titan Books for the coordination and arrangement. What If The Avengers Were Made in Japan?